In our deep and heartfelt commitment to creating an equitable world, The Winters Group developed a corporate social responsibility arm– Live Inclusively® Actualized (LIA)– that focuses on the efforts surrounding this commitment. We envision a world that has fully actualized access, equity, and inclusion for all people. We aim to break down systemic barriers that impact marginalized communities through grantmaking, programs, and service opportunities that promote inclusion, equity, and justice. 2018 was The Winters Group’s inaugural year for Live Inclusively® Actualized, and we fulfilled our mission in various ways. We work and live by the Marian Wright Edelman quote, “Service is the rent we pay for being. It is the very purpose of life, and not something you do in your spare time.” We hope this is evident in how we show up with our partners and in our communities. To see the full impact LIA had in 2018, download our annual report. The programs for which the grant funds will be used must be established and able to demonstrate outcomes over a period of time. To apply, please submit a proposal package with all requested contents. 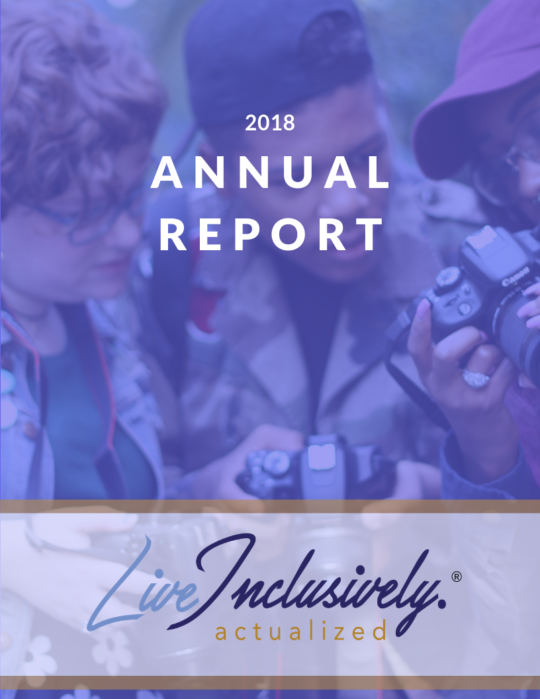 2018 was The Winters Group’s inaugural year for Live Inclusively®Actualized, and we fulfilled our mission in various ways. We work and live by the Marian Wright Edelman quote, “Service is the rent we pay for being. It is the very purpose of life, and not something you do in your spare time.” We hope this is evident in how we show up with our partners and in our communities. 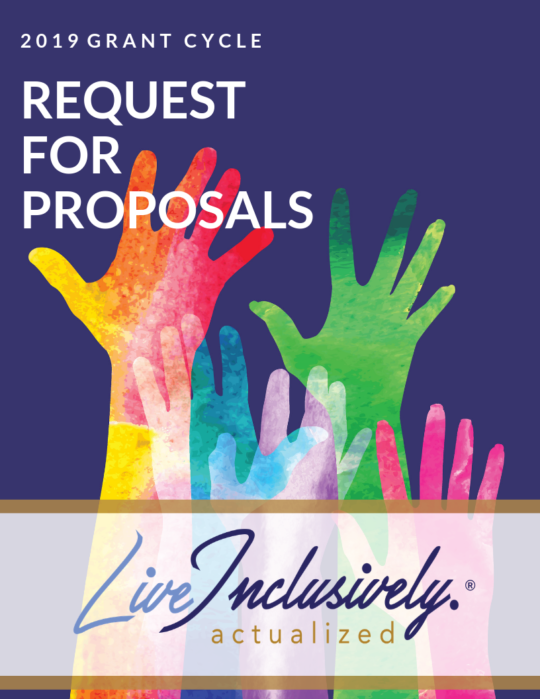 Make the Commitment to Live Inclusively®! 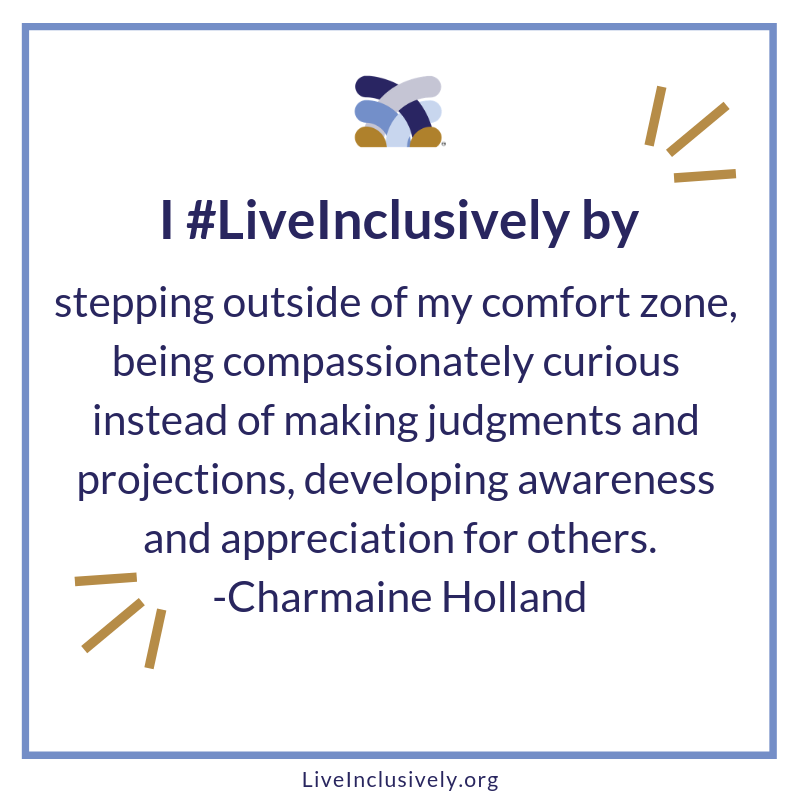 I commit to be intentional in living inclusively. I commit to spending more time getting to know myself and understanding my culture. It is in understanding myself, that I am better positioned to understand others. I will acknowledge that I don’t know what I don’t know, but I will not use what is unconscious as an excuse. I will be intentional in exposing myself to difference. If I don’t know, I will ask. If I am asked, I will assume positive intent. Most importantly, I will accept my responsibility in increasing my own knowledge and understanding. I commit to speaking up and speaking out, even when I am not directly impacted, for there is no such thing as neutrality in the quest for equity, justice, and inclusion. I will strive to accept, and not just tolerate; respect, even if I don’t agree; and be curious, not judgmental. I commit to pausing and listening. I will be empathetic to the experiences and perspectives of my “others”. I will use my privilege positively, and get comfortable with my own discomfort. 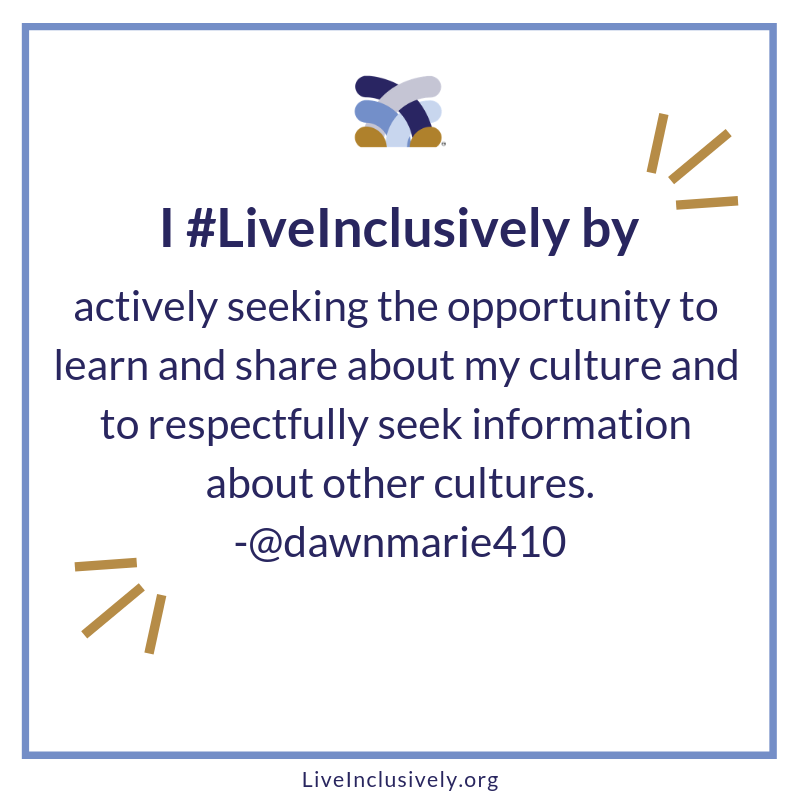 I commit to knowing, getting, and doing better than I did yesterday—keeping in mind my commitment to live inclusively is a journey, not a destination. 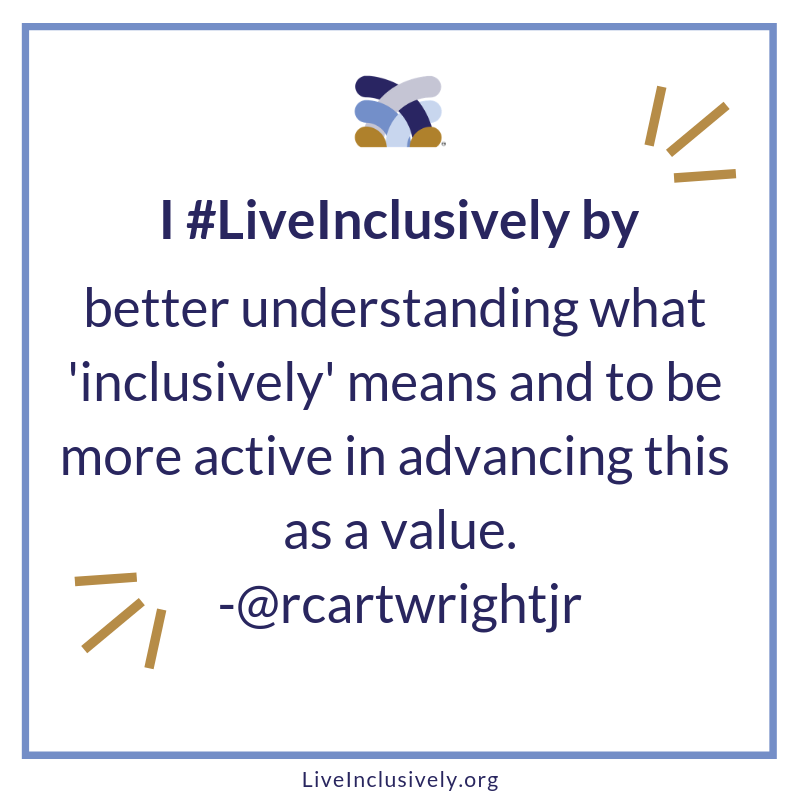 How do you live inclusively? (Optional) Please enter your social media handle. *Note: By entering your social media handle above, you are giving us permission to attribute your response to you on social media. Please leave blank if you would like to remain anonymous.